UNESCAP and Leonard Cheshire Disability recently launched the Disability-Inclusive Millennium Development Goals (MDGs) and Aid Effectiveness Conference from 14-16 March 2012 in Bangkok, Thailand. The conference was inaugurated by the Royal Thai Government and was held at the United Nations Convention Center in Bangkok, Thailand. 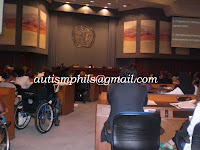 Autism Society Philippines (ASP) was represented by Executive Director, Ranil Sorongon. 3. Identifying ways to implement disability-inclusive development effectively on the ground and at the policy level. Sorongon acted as the voice over of Mr. Lauro Purcil when the latter presented on the topic “Monitoring the UNCRPD Through Direct Involvement in the National Budget Process: The Philippine Experience”. Two other members of the Philippine Coalition also presented during the conference, Ms. Liza Martinez on “MDGs and Education of Children with Disabilities in the Philippines: Some Observation and Recommendations” and Mr. Abner Manlapaz on “The Disability Discount, Disability Pension and Conditional Cash Transfer Program (CCT) in the Philippines”. Like the other participants, the Filipino delegates acquired a lot of information from UN Agencies, International NGOs, international donors but most of all from the experiences of other persons with disabilities who presented at the conference. One common realization of the participants was “persons with disabilities were not included in the MDGs” so there is an urgent need for Persons with Disabilities in all development frameworks to realize the provisions of the UN Convention on the Rights of Persons with Disabilities to really “Make their Rights Real”. ASP is among the core group members of the newly organized Philippine Coalition on UN Convention on the Rights of Persons with Disabilities and also a member ASEAN Autism Network based in Bangkok, Thailand.